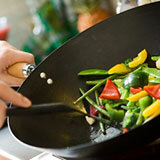 Photo: Cooking vegetables in a pan. Knowing how to cook is a one of the most useful skills we can learn. If we can cook, we can eat healthy dishes made at home with fresh ingredients instead of having to buy unhealthy fast food or expensive pre-cooked or frozen meals. Cooking our own meals is not only healthy and cheap, but can also be fun if we explore cookbooks and cooking websites and find new recipes to try. 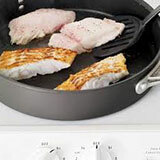 Even if you only have a small stove or cooker with a couple of hotplates, you can cook delicious food at home. 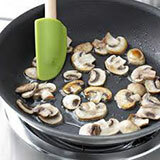 You can fry meat, fish or eggs in a frying pan with oil or butter. 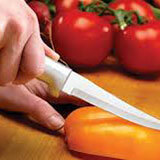 You can also chop or slice vegetables and sauté or stir-fry them in a pan or a wok. Another way of cooking vegetables and grains like rice is by boiling or steaming them. You can peel vegetables like potatoes and carrots before cooking them, and even mash them after they're cooked if you like. You can also boil other foods like spaghetti, eggs and certain meats, or steam fish and other seafood like crabs and mussels. With a simple hotplate you can also make soups and stews. The ingredients for these often include diced meats and vegetables as well as a pinch of salt. You can also sprinkle in spices like pepper or paprika or add herbs like basil or parsley. You can even make sauces by melting butter in a saucepan and mixing in flour and milk before adding other ingredients like grated cheese and then stirring until your sauce is smooth. If you have a stove with a grill or broiler, or an appliance such as an electric grill, you can also grill meat, fish and vegetables. If you're grilling food at a high temperature, be careful. It's easy to burn it if you cook the food for too long. 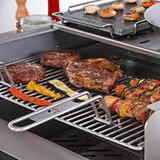 But many people love grilling, and some even say it's the best way to cook fish, steak and many other meats. If you also have an oven you can roast certain meats and vegetables. 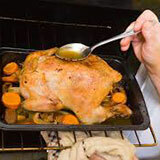 In an oven, food is surrounded by hot air that gradually cooks from all sides, so roasting a whole chicken or a leg of lamb takes time. After being cooked, roast meat is carved into pieces before being served, often together with roast potatoes, carrots and onions. A meal like this is sometimes called a "Sunday roast" as it was traditionally cooked every Sunday in countries like England and Australia. 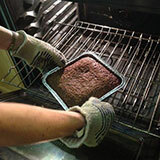 Ovens can also be used to bake foods like bread, cakes, cookies, pastries and pies. The main ingredient of most baked foods is wheat flour. After being sifted to remove any lumps, the flour is used to prepare a batter or dough that's put into a preheated oven to bake. People often think baking is difficult, but as the following recipe shows it can be easy if you have simple directions to follow. Preheat oven to 350 degrees F (175 degrees C). Grease and flour a cake pan. 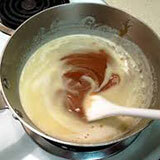 In a mixing bowl, cream together the sugar and butter. Beat in the eggs, then add a tablespoon of vanilla extract and whisk. Add flour to the mixture and stir in milk until the batter is smooth. Pour or spoon batter into the greased cake pan. add (verb): to put something else in - Add grated cheese to the white sauce and stir. bake (verb): to cook in an oven - I can bake cakes and pies, but I can't bake bread. beat (verb): to mix eggs, cream, etc. 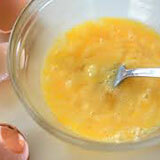 with a fork, a beater, or a whisk - To make scrambled eggs, beat the eggs before cooking them. 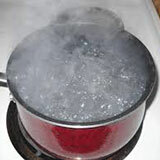 boil (verb): to cook in boiling water - Will you boil the vegetables, or steam them? 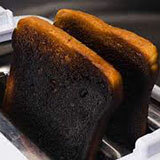 burn (verb): to spoil food by cooking it for too long or at a temperature that's too high - Please don't burn the toast. carve (verb): to cut slices or small pieces from a large piece of cooked meat - Who'd like to carve the roast chicken? 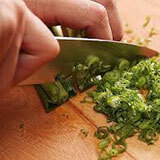 chop or chop up (verb): to cut into small pieces with a sharp knife - It's easy to cut yourself when chopping onions, so be careful. 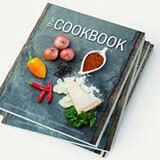 cook (verb): to prepare food for eating - What are you cooking for dinner? cookbook or cookery book (noun): a book of recipes, often with pictures - Can I borrow that cookbook with all the Asian recipes? dice (verb): to cut food into small cubes or squares - Dice the carrots and potatoes and add them to the soup. dish (noun): food that's cooked in a certain way - My favourite Indian dish is vegetable curry. 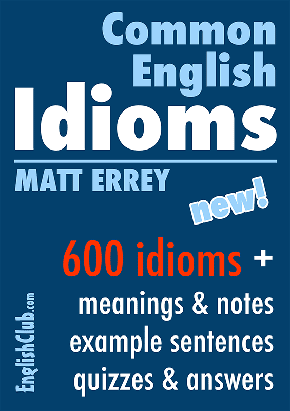 fry (verb): to cook food in hot oil, butter or fat - Heat some olive oil in a frying pan and then add the diced tomatoes. 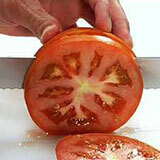 grate (verb): to cut tiny slices from cheese, vegetables, chocolate, etc. 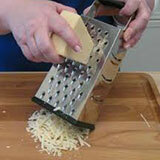 with a grater - Grate half a cup of cheese and sprinkle it on top. grease (verb): to rub butter or oil onto a baking pan or dish to stop food from sticking - Should I grease the cake tin with butter or oil? grill (also US "broil") (verb): to cook directly over or under a very hot gas flame or electric element - Is the fish grilled under a gas grill or an electric grill? herb (noun): a plant used for adding flavour to food - Good cooks always know which herbs to use. ingredient (noun): any food, liquid, herb or spice that's used to make a particular dish - Chilli and fish sauce are basic ingredients in many Thai dishes. 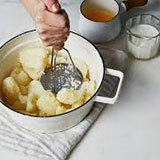 mash (verb): to crush food like cooked potato until it's a smooth mass - Could you mash the potatoes, please? 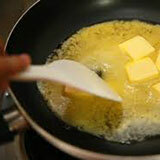 melt (verb): to turn a solid substance into a liquid by heating - Melt some butter in a saucepan and then add the flour. mix (verb): to combine two or more substances - The flour is mixed with a little oil and warm water to make a dough. 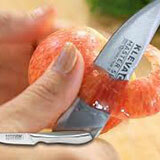 peel (verb): to take or cut the skin off a vegetable or fruit - I get juice all over my fingers if I peel an orange. pinch (noun): a very small amount of something like salt or ground spice - Add a pinch of salt to the water before boiling vegetables. preheat (verb): to turn on and heat an oven or grill before cooking - It's important to preheat your oven before baking scones. 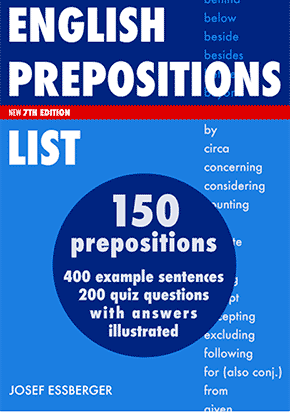 prepare (verb): to make food ready for cooking or eating - It takes an hour or more to prepare this dish. recipe (noun): a list of ingredients and instructions for cooking a particular dish - My grandmother gave me this recipe for apple pie. 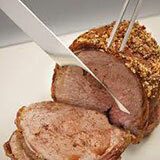 roast (verb): to cook foods like meat and vegetables in an oven - Why don't we roast some vegetables as well? sauté (verb): to fry quickly in hot oil or fat - To begin, sauté the onions and garlic in a saucepan. serve (verb): to give someone food that's been prepared or a drink - Make sure the food's still hot when you serve it. spice (noun): a plant part, often ground into a powder, that adds flavour to a dish - Which spices did you add to this sauce? sprinkle (verb): to add a few drops of liquid or a substance like salt or pepper by shaking a container or by using your fingers - Why do you sprinkle so much salt on everything? 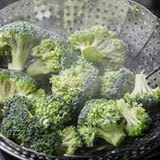 steam (verb): to cook in hot steam from boiling water - Steaming vegetables destroys fewer nutrients than boiling them. stir (verb): to move a spoon or other implement around to mix something - If you don't stir the sauce enough, it'll be lumpy. stir-fry (verb): to fry quickly over a high heat while stirring - Lots of people stir-fry all kinds of meat and vegetables these days. 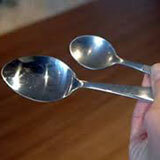 tablespoon (abbrev: "tbsp") (noun): a large spoon used for serving, or the amount of an ingredient that fits in one - Add a tablespoon of flour to the melted butter and stir. teaspoon (abbrev: "tsp") (noun): a small spoon or the amount of an ingredient that fits in one - You didn't use more than half a teaspoon of chili powder, did you? 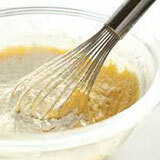 whisk (verb): to mix something very quickly with a whisk - Break the eggs into a bowl and whisk until smooth.